When I lived away from home for a long time, I was beset by food cravings. Following a visit, my luggage would be wildly overweight with emergency rations of all those things I had identified as being the taste of home. I carried away dozens of bite-sized Cherry Ripe and Violet Crumble bars; packets of Arnott’s Iced Vo Vo biscuits; at least one can of golden syrup, since English syrup is lighter both in colour and flavour and how else was I to bake Anzac biscuits? And in my suitcase there was always a one-kilo jar of Vegemite, enough to see me through until the next visit. Vegemite is a much misunderstood product. People who haven’t grown up with it either love it or hate it, and I eventually gave up spruiking its virtues to the Marmite-fanciers of England. It’s the tastes you are raised on that, for good or bad, speak of home, and while our sense of who we are and where we belong in the world is arrived at by complex pathways, there is definitely a whistlestop at the tastebuds. As children we would stir a spoonful of Vegemite into a mug of hot water and drink it as a broth. Sometimes we’d drop in cubes of bread and eat them, soggy and delicious from the spoon. If you were off your food for some reason, you could usually manage a cup of Vegemite soup. I still turn to it now and then for comfort. 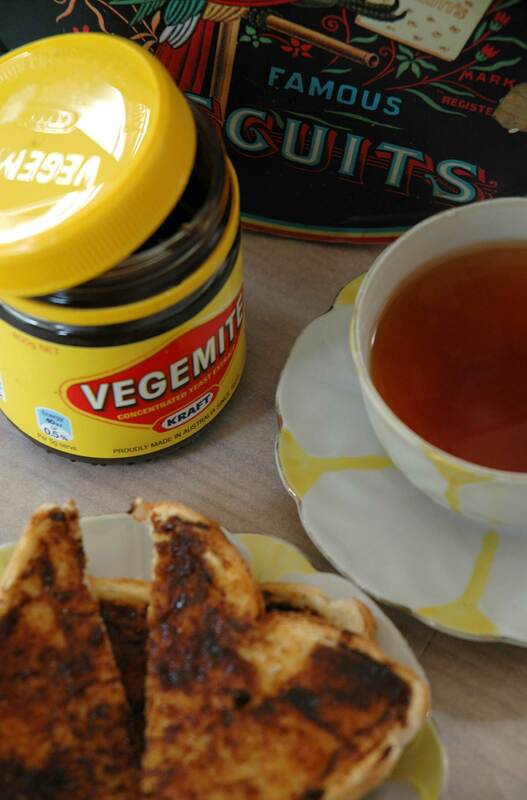 The recipe I’m going to give you involves a teaspoon of Vegemite but it is not nostalgic. I discovered it as an adult in The Cranks Recipe Book, and it soon became a favourite. It’s one of the most versatile vegetarian recipes of all time. I’ve used it at Christmas, as a base for a great vegetarian Shepherd’s Pie, and even as a sandwich spread. For Cranks Nut Roast you will need: 1 medium-sized onion; 1oz of butter or margarine; 8oz of mixed nuts, all kinds or just a few; 4 oz wholemeal bread (about 4 slices); 1/2 pint vegetable stock or water with 2tsp yeast extract dissolved (I use 2 teaspoons of vegemite to flavour the stock); mixed herbs; optional salt and pepper. Chop the onions and saute in the butter until tranparent. Grind nuts and bread in a food processer until quite fine. Heat the stock and yeast extract to boiling then combine all the ingredients together and mix well. The mixture should be fairly slack. Turn into a greased baking dish, level the surface, sprinkle with a few breadcrumbs and bake at 180 degrees (350F) for 30 minutes or until golden brown. Serve hot or cold, with vegetables or salad. You can even use the mixture to make up rissoles. Non-vegetarians love it, too. In fact, no need to describe it as vegetarian – it’s just simple and good, and as with most of the recipes I love best, it has no more than six ingredients. The Cranks Recipe Book, published by Orion. London, 1982. 20 Jul	This entry was published on July 20, 2012 at 9:37 am. It’s filed under Uncategorized and tagged arnotts biscuits, beautiful breakfasts, cherry ripe, cranks nut roast, creative writing, food, food and memory, food writing, home, iced vo vo biscuits, marmite, vegemite, violet crumble, winter. Bookmark the permalink. Follow any comments here with the RSS feed for this post.